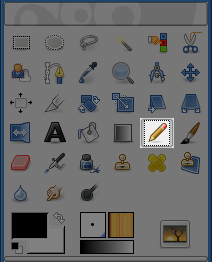 The Pencil tool is used to draw free hand lines with a hard edge. The pencil and paintbrush are similar tools. The main difference between the two tools is that although both use the same type of brush, the pencil tool will not produce fuzzy edges, even with a very fuzzy brush. It does not even do anti-aliasing. Why would you want to work with such a crude tool? Perhaps the most important usage is when working with very small images, such as icons, where you operate at a high zoom level and need to get every pixel exactly right. With the pencil tool, you can be confident that every pixel within the brush outline will be changed in exactly the way you expect. If you want to draw straight lines with the Pencil (or any of several other paint tools), click at the starting point, then hold down Shift and click at the ending point. or by clicking on the N keyboard shortcut. This key changes the pencil to a Color Picker.